Brightening - All Skin Types. 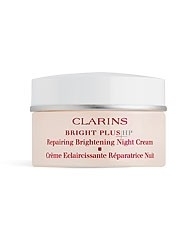 A fresh, comforting cream which not only soothes, revitalises and moisturises but helps to repair skin effected by UV exposure and stress, slow down excess pigment production and detoxify. Come morning the skin looks brighter, more radiant and the features look better defined and more rested. HP Lock-Around System (Alchemilla, Raspberry,Vitamin C), Parsley and Camomile: brighten and even skin tone. Parsley, Raspberry and Alchemilla extracts: help preserve skin&#039;s translucency. Coconut oil, Xanthan gum: moisturise and revitalise. I used a tester of this cream for one month. The cream is very rich and I was worried that it would breakout my skin but I was amazed that it caused no greasiness or irritation. The cream is easily absorbed and immediately your face feels thoroughly moisturised and smooth. In the morning my skin was plumped and glowing. I sadly did not notice any difference in my pigmentation marks. After 4 week’s use I felt that this cream was a little too heavy for my needs but none the less I was impressed with this product.